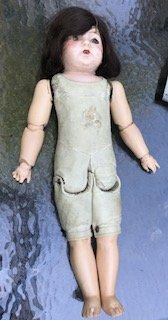 Need help identifying doll from 1920's ?? 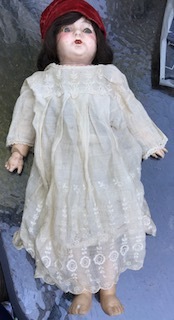 This doll belonged to my mother who was born in 1915. She is 22" long, has a leather body and movable arms and legs. I do not know what the arms and legs are made of. Her head is a different material than the arms and legs. She has eyes that roll up and down, what looks like brown, human hair. No identifying marks anywhere. She is leaking sawdust from her joints. She has a red velvet hat and a lacy dress and slip. This doll has been in a paper bag for at least 65 years! 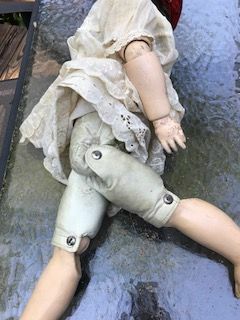 My mother held on to this doll when she became an orphan at 4 years old. She bounced from relative to relative for almost 2 years until neighbors finally took her in until she was 16 years old when her oldest sister got married and they took her in. I would love to know the origins of this doll. She needs some work. thank you for any information!! Comments for Need help identifying doll from 1920's ?? This doll, especially the body, looks so much like my German Amburg Amkid doll. Different materials though. My doll has composition head, wood arms, composition hands and composition legs. Also has oilcloth body stuffed with cork. Made in 1918. I'm not saying it is an Amburg,but it sure favors one. Can I suggest you look up some books on doll collecting. My(Australian) mother born in 1911 went back to England as a child and was given a similar doll. The head is probably porcelain and the arms maybe bisque (composite). Good luck in your search. You may not find the exact manufacturer (without distinguishing marks) but you may get an idea of when and where.